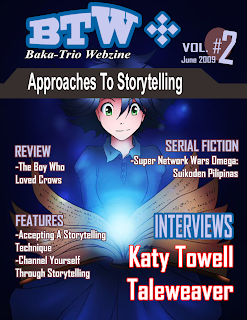 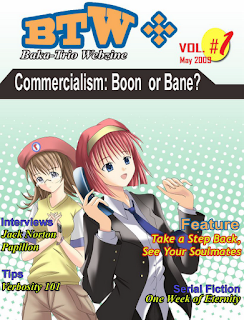 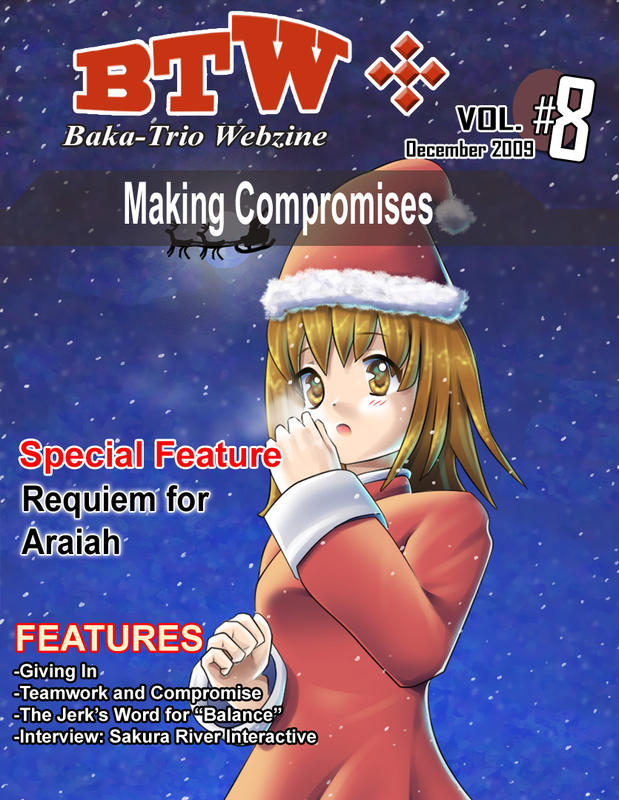 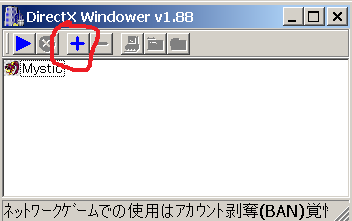 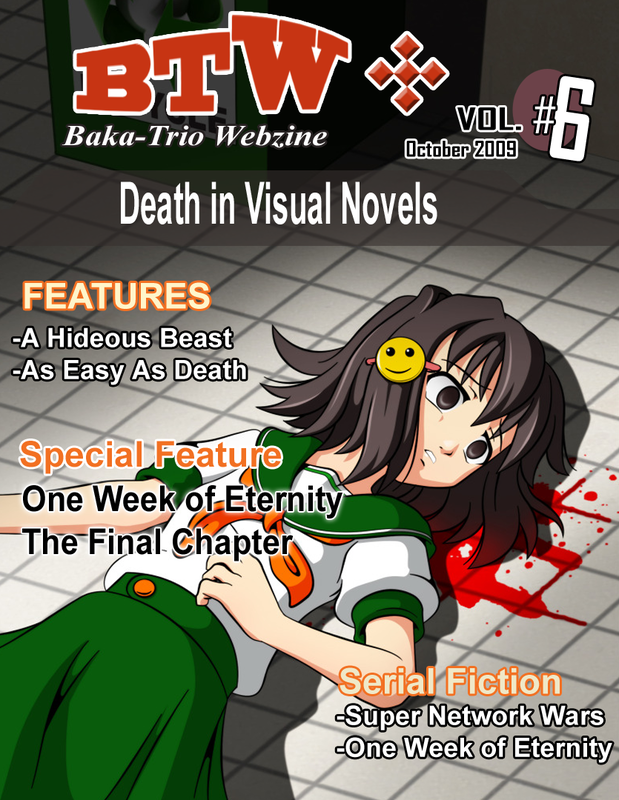 BTW or Baka-Trio webzine was an online ezine that was established by the active chatters of #baka-trio on Freenode. 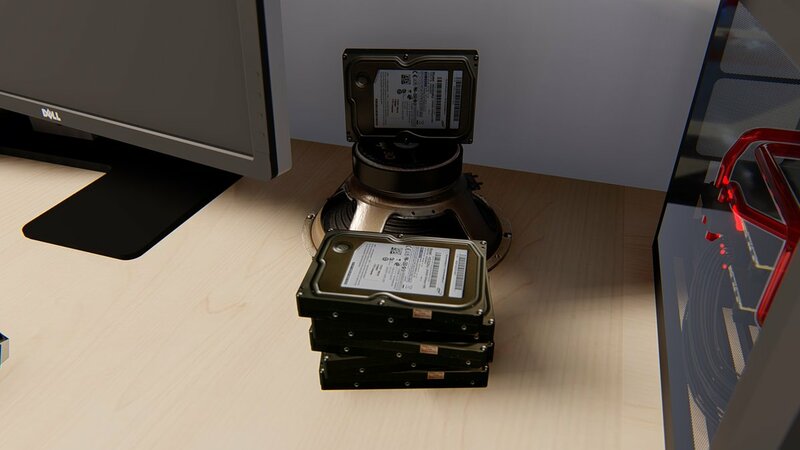 All of our members were regulars of the Lemmasoft Forums with quite a few whose experiences in the EVN community dated back to the initial launch of Lemmasoft. 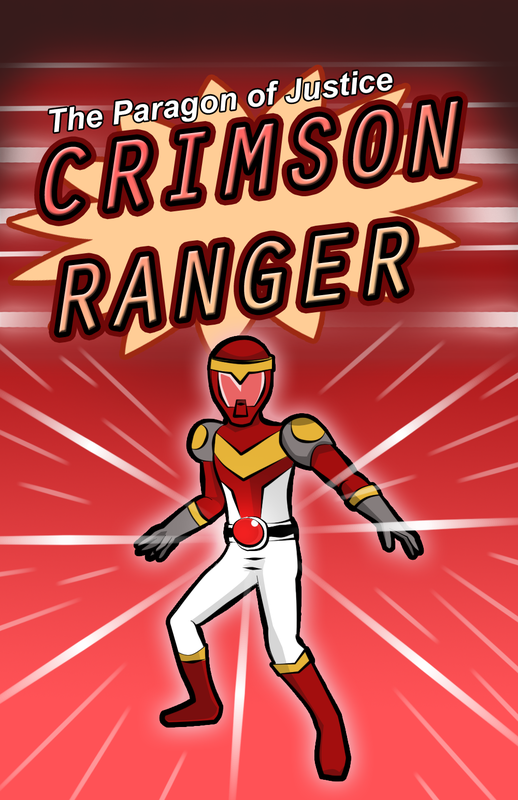 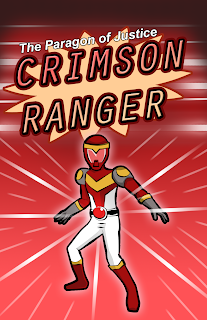 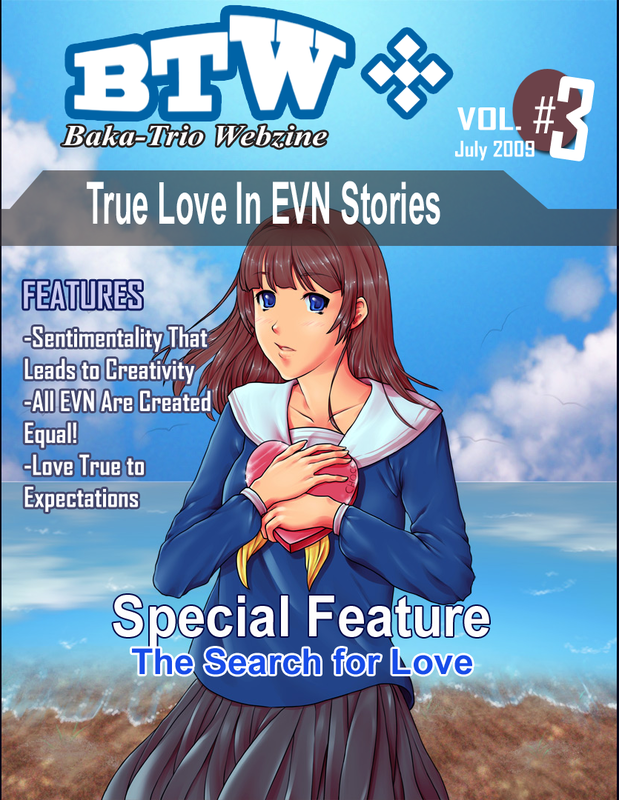 BTW was initially my idea, which I brainstormed together with Kikered in order to create a project that would unify the members of #baka-trio in a productive but relatively stress-free endeavor that did not actually entail creating visual novels, but which was at least tangentially-related. 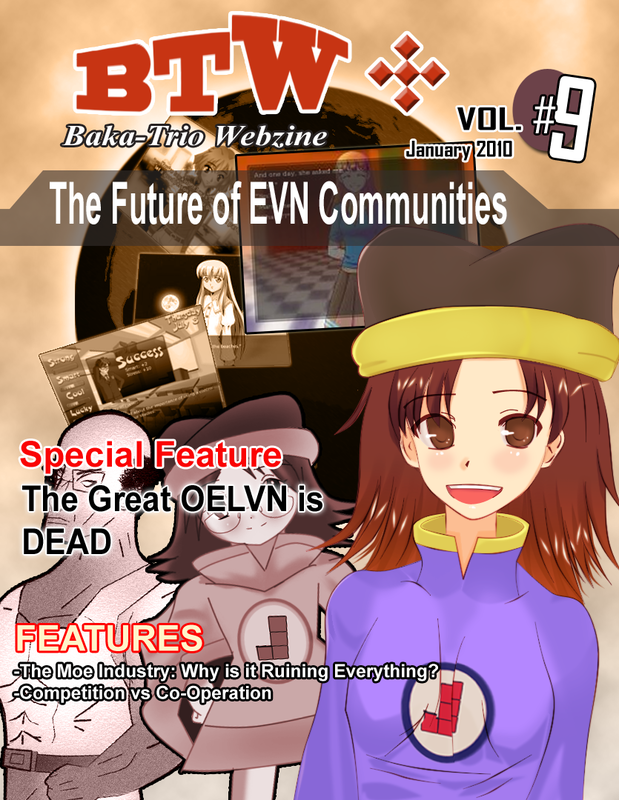 In the end, the project turned out to be a relative success with the announcement of the new Teacup Forums along with the release of Volume #9 of the Ezine. 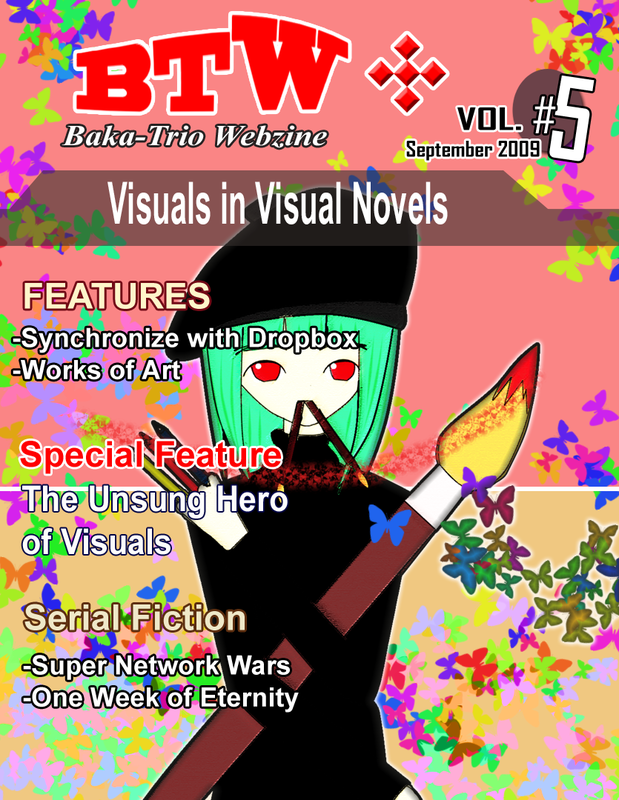 In essence, BTW was a project that we made for ourselves. 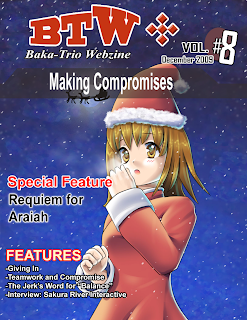 It was not meant to provide any sort of service to the community, but was merely a creative outlet whose main purpose was to unite the limited members of #baka-trio who were beginning to drift away from each other at the time of the project’s initial conception. 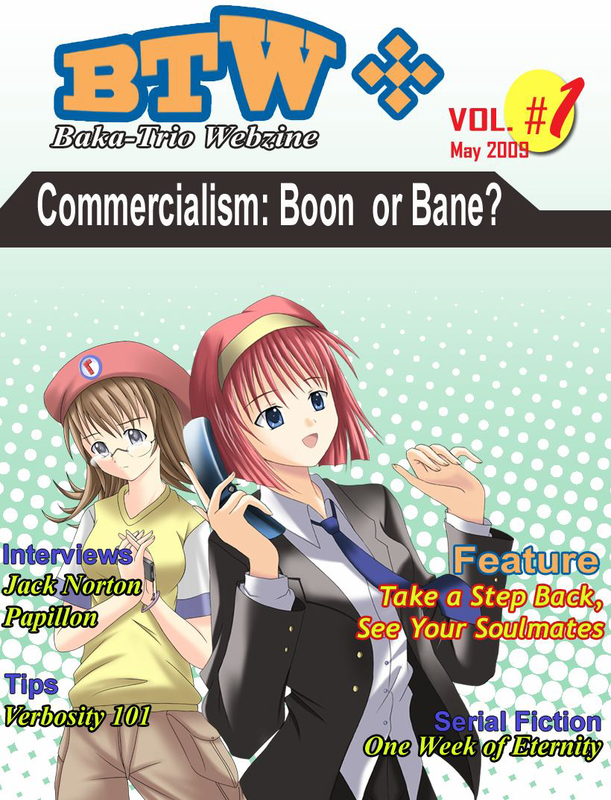 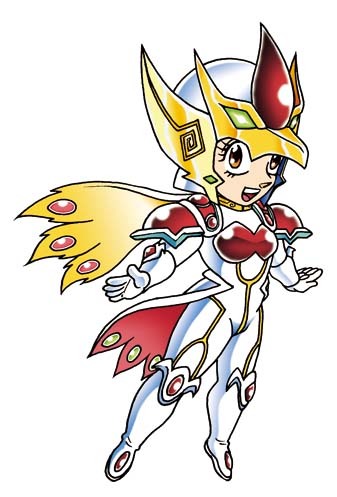 BTW ran for 9 consecutive volumes released on a monthly basis from May 2009 to January 2010. 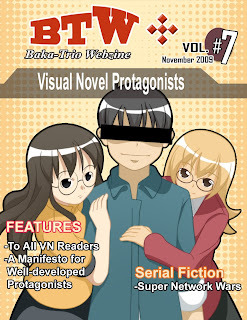 Volume 10 came out in April 2011 and put an exclamation point on the project, putting it to rest forever. 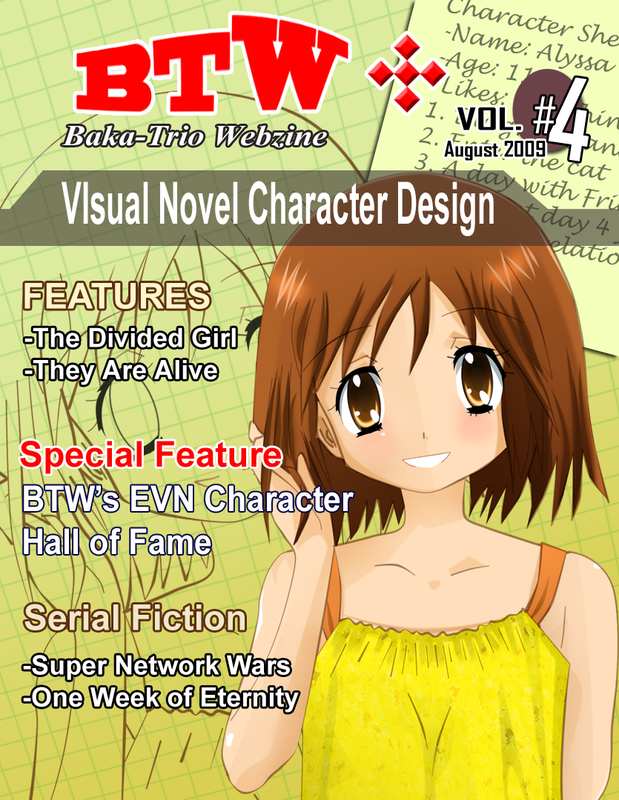 The zine used a predominantly 2-columns style of layout heavily inspired by Reader’s Digest Magazine and was filled mostly with human-interest essays with occasional interviews from EVN creators as well as those engaged in working with similar media such as Katy Towell of Childrin R Skary fame. 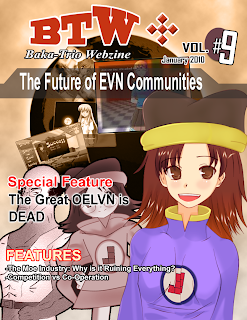 As early as the January 2010 volume, we actually felt that BTW had served its purpose with the launch of the current Teacup Community. 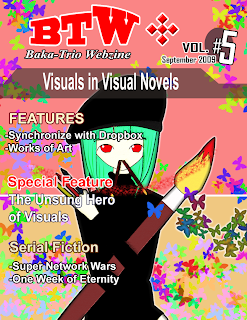 One reason that the Zine saw heavy criticism may be because the writers behind the articles were mostly veterans of an older LSF who felt no small degree of dissatisfaction with the somewhat rapid changes which were taking place in the LSF of 2009. 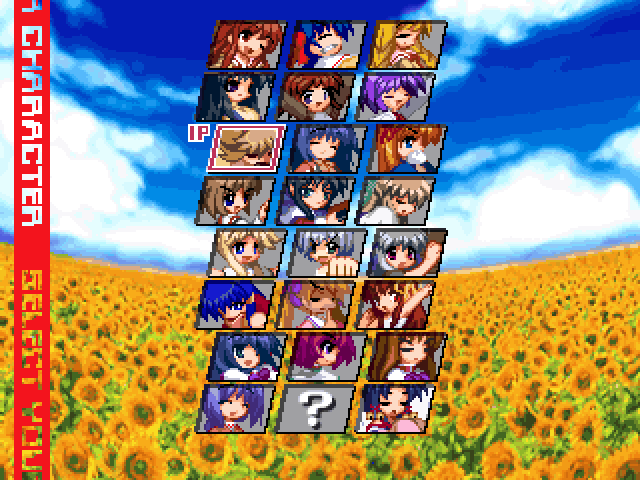 It was a time when some of the more vocal members of 4LS were heavily criticizing the community and where troll posting and thinly-veiled personal attacks were the norm with only one active administrator in PyTom trying to keep it all together. 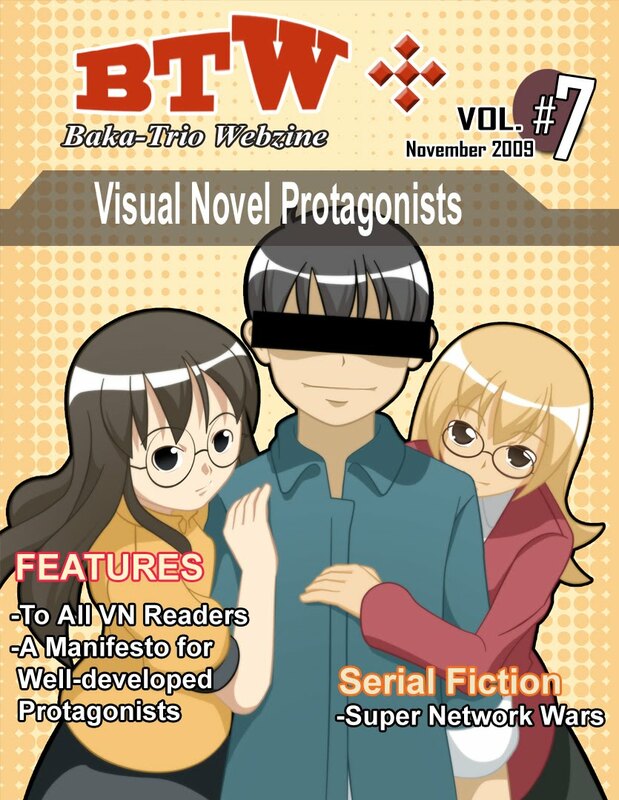 Speaking in behalf of the people behind BTW, many of us felt that the smaller LSF from the past wherein due respect was given to each creator and even a visual novel with a fatal flaw could be lauded for an innovative feature or for using a unique approach to storytelling using limited resources, was quite preferable to the LSF of 2009 which laid the groundwork for the LSF of 2012 and beyond. 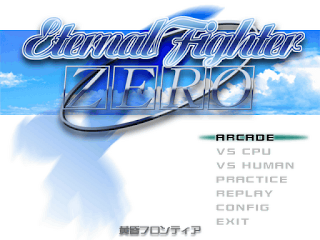 At that time, we had no idea that 2009 would be a pivotal year for the LSF – a “changing of the guard” would happen soon afterwards. 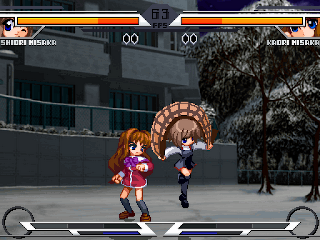 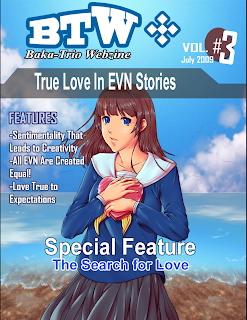 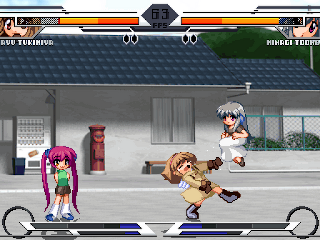 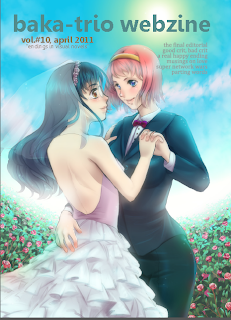 Having said that, the zine may be considered as a piece of reactionary literature as well as a relic of the past – a doorway to how the creators of the LSF of the past thought and operated before everyone started wanting to emulate Type Moon, Katawa Shoujo and currently, Sakevisual, Winterwolves and Hanako Games. 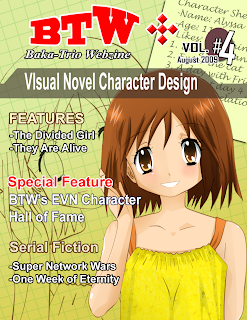 The zine cannot serve as a historically accurate document save for the release dates of some choice EVN, which are mirrored in the current Ren’py.org release list, for the simple reason that its writers were heavily-opinionated individuals who mostly wrote opinion pieces. Due to this non-journalistic approach to the ezine, we can proudly proclaim that the articles contained within BTW are timeless.